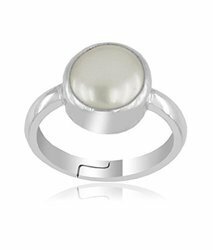 Manufacturer of a wide range of products which include natural south sea pearl ring, 7.25 ratti south sea pearl ring, 5.25 ratti natural south sea pearl ring and 12.25 ratti natural south sea pearl ring. According to Vedic Astrology Pearl represents the planet Moon. If there is a beneficial Moon in your horoscope, you must wear a Pearl. According to Astrology, Moon reflects the human mind, Its impact is on our thinking. Pearls in maintaining the stability of our minds is proven extremely Useful. One can have good relations and have many benefits from mother by wearing Pearl. Wearing pearls increases self-confidence. Related diseases in our body fluids, which can be control by wearing the Pearl , such as blood, Pressure and bladder disease, but it’s important to seek the advice of experienced astrologer, as in case of being malefic Moon in horoscope the Pearl can be damaging. Diseases like dementia coil is located in the horoscope is because of Evil Moon, this is the reason that it is very important to know position of Moon in the horoscope before wearing a Pearl. How to wear Pearl – Moti ? If you want to wear a Pearl Gemstone, you can wear a 5 to 10 carats south sea pearl. Make it in silver ring and wear it in the morning of any Monday during Shukla Paksha, wear it in the last finger. For Purification and activate the Pearl gemstone , dip the ring in milk, honey and pure water, for 20 to 30 minutes, Burn 5 incense sticks to Name of Chandra Deva and pray that you are going to wear the representative gemstone Pearl to have Blessings from Chandra Deva. Then take out the ring from the pure water and round it up the incense sticks 11 times while speaking the mantra ॐ सों सोमाय नम: after the mantra you can wear it in your little finger. Pearl will give effects within 4 days after wearing and till 2 years it will give full effects, after that it becomes inactive, You must change your gemstone after inactivation. 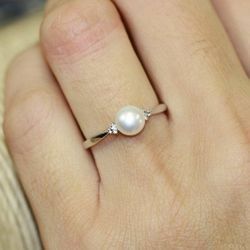 For good results you can wear a South Sea or Valenzuela Pearl . Cheap and bad gemstones can produce malefic results. 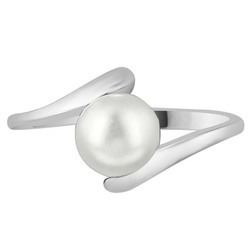 In which finger pearl moti should be worn according to astrology? According to astrology generally pearl moti gemstone should be worn in small finger of right hand. what day and time red pearl moti gemstone should be worn ? 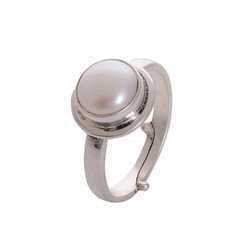 for good astrological effects, one should wear pearl moti on Monday morning between 5 am to 7 am. in shukla puksha days. In which mettle one should wear red pearl moti gemstone ? 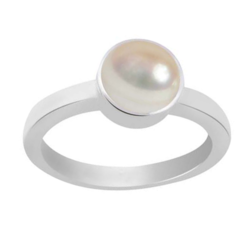 For best results pearl moti gemstone should be worn in silver ring only . Is it must to activate the pearl moti gemstone before wearing ? Without activating the pearl moti gemstone with right astrological process may give bad effects. So it is must to activate the pearl moti gemstone with Chandra Deva Mantras before wearing. Pearl Moti Price In India. South sea cultured pearl price starts from INR 500 to INR 2000 per carat in India. K C pearl cultured price starts from INR 2000 to around INR 5000 per carat in India. Valenzuela and Basra natural pearl price starts from INR 10000 to INR 100000 per carat in India. How do i know if i should wear a pearl gemstone or not? If you want to wear a Pearl Gemstone, you can wear a 5 to 10 carats south sea pearl. 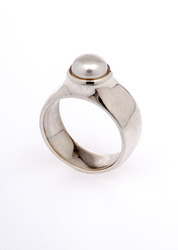 Make it in silver ring and wear it in the morning of any Monday during Shukla Paksha, wear it in the last finger. For Purification and activate the Pearl gemstone , dip the ring in milk, honey and pure water, for 20 to 30 minutes, Burn 5 incense sticks to Name of Chandra Deva and pray that you are going to wear the representative gemstone Pearl to have Blessings from Chandra Deva. Then take out the ring from the pure water and round it up the incense sticks 11 times while speaking the mantra ¿¿¿ ¿¿¿¿¿¿¿¿¿ ¿¿¿¿¿¿¿¿¿¿¿¿¿¿¿ ¿¿¿¿¿¿: after the mantra you can wear it in your little finger. Pearl will give effects within 4 days after wearing and till 2 years it will give full effects, after that it becomes inactive, You must change your gemstone after inactivation. For good results you can wear a South Sea or Valenzuela Pearl . Cheap and bad gemstones can produce malefic results. You must wear any gemstone only after consulting an expert, you must check your horoscope by an experienced astrologer before wearing a pearl gemstone, If you want to consult me you can call on this . If you want to wear a Pearl Gemstone, you can wear a 5 to 10 carats south sea pearl. Make it in silver ring and wear it in the morning of any Monday during Shukla Paksha, wear it in the last finger. For Purification and activate the Pearl gemstone , dip the ring in milk, honey and pure water, for 20 to 30 minutes, Burn 5 incense sticks to Name of Chandra Deva and pray that you are going to wear the representative gemstone Pearl to have Blessings from Chandra Deva. Then take out the ring from the pure water and round it up the incense sticks 11 times while speaking the mantra after the mantra you can wear it in your little finger. Pearl will give effects within 4 days after wearing and till 2 years it will give full effects, after that it becomes inactive, You must change your gemstone after inactivation. 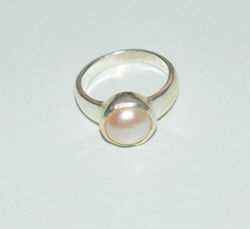 For good results you can wear a South Sea or Valenzuela Pearl . Cheap and bad gemstones can produce malefic results.